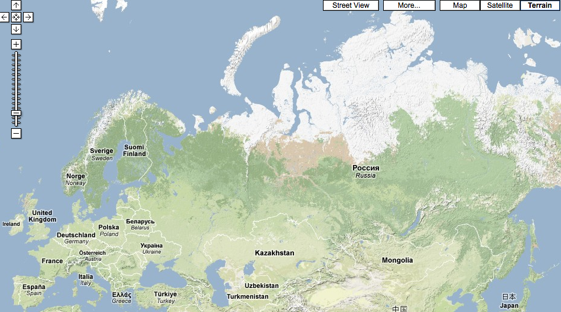 For Web companies looking to expand abroad, Russia needs to be at the top of their list of markets to enter. 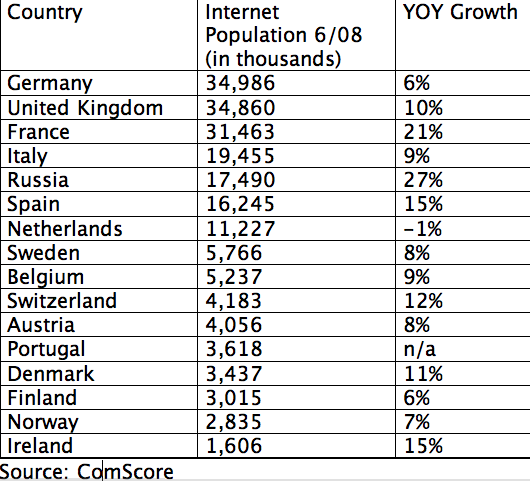 Russia has the fastest growing Internet population in Europe, followed by France and Spain. In a comparison of 16 European Internet populations by country, comScore reports that Russia’s Internet audience for the month of June grew 27 percent year over year, compared to 21 percent growth in France and 15 percent growth in Spain. (Is Russia part of Europe? It is for the purposes of this analysis). If you look at the total size of the Internet populations in each country, however, Russia ranks fifth with 17.5 million monthly Internet visitors. 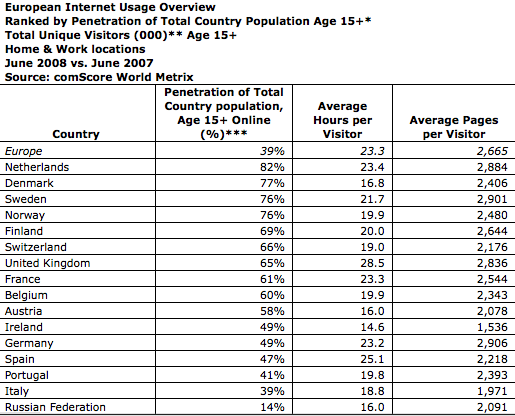 But by Internet penetration, Russia ranks last, with only 14 percent of the total population online. So there is still lots of room for growth there. France also has strong showing, with 21 percent growth, and ranks third after Germany and the UK in total Internet population, with 31.4 million visitors in June and a 61 percent penetration rate of the total population. The Netherlands, which has the highest penetration rate at 82 percent, actually showed a one percent decline to 11.2 million Internet visitors. I guess there is a limit to growth, even on the Internet. 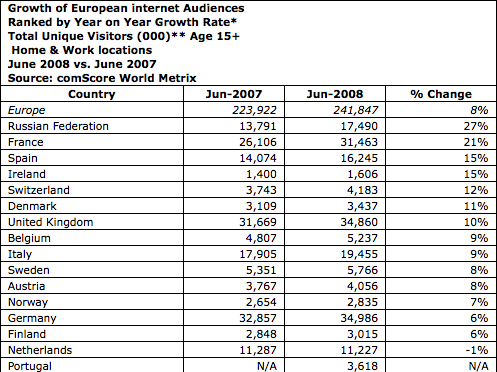 In terms of regional comparison, comScore counts 240 million unique visitors across Europe in June, versus 190 million in the U.S. and 327 million in the entire Asia-Pacific (excluding public computer usage). Below are tables ranking the countries by size, growth rates, and penetration. And here is the list ranked by penetration of the total population. Just because a country has a high Internet penetration does not mean it is a huge market (for instance Norway has 76 percent penetration, but only 2.8 million total Internet visitors).